Last week public relations and measurement professionals met in Lisbon for a Summit hosted by AMEC (The International Association for Measurement and Evaluation of Communications). Of interest, was an workshop that was designed to begin setting the standards in social media measurement co-facilitated by KD Paine, an expert in communications and social media measurement. (KD Paine and I will be collaborating on a project in the coming months). The workshop shared a landscape analysis of what’s already out there from the various industries in order to build a clear understanding of what’s in place and what isn’t in terms of social media measurement valid metrics. 1: Set SMART objectives and identify a measurement strategy at the start of your campaign or program: Social media measurement should take a holistic approach including both traditional and social media and look at changes in awareness among key audiences, attitude, action, and behavior change that impact business results. 2: Measuring the Effect on Outcomes is Preferred to Measuring Outputs: Measure your results, not just numbers. A typical output measure might be the number of visitors to a web site or participants in a program. 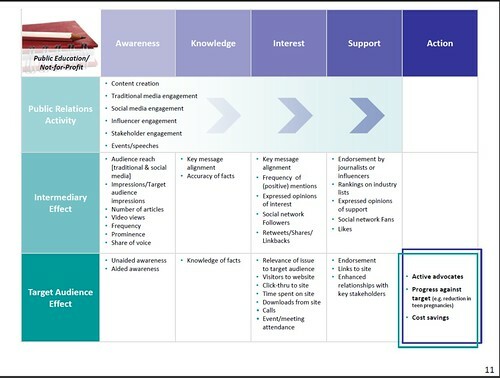 What should be measured are shifts in awareness, comprehension, attitude and behavior related to donations, purchase, branding, reputation, public policy, employee engagement, and other shifts in audience beliefs or behaviors related to SMART objectives. 3:The Effect on Business Results Can and Should Be Measured Where Possible: The confusion around whether or not you can measure social media has moved from “you can’t measure social media” to figuring out what to measure. 4: Media Measurement Requires Quantity and Quality: This principle is about measuring both quantative and qualitative information. It isn’t just impressions, but you should also look at measuring tone, relevance, message delivery, and sentiment. 5: Beware of Bogus Metrics like AVEs for ROI: AVEs stands for “Advertising Value Equivalents” or as KD Paine likes to call it “Assessment By Voodoo Economics” . This is using bogus social media metrics to translate into some value. Geoff Livingston has a good post about the problems with this – using influence as the metric. 6: Social Media Can and Should be Measured: This principle is about incorporating the discipline of measurement into your approach and to go beyond just measuring “coverage” but also measure conversation and communities. We’ve come a long way since the early days of social media in terms of measurement practice. 7:Transparency and Replicability are Paramount to Sound Measurement: Measurement methods need to be shared as well as how specific metrics are calculated. 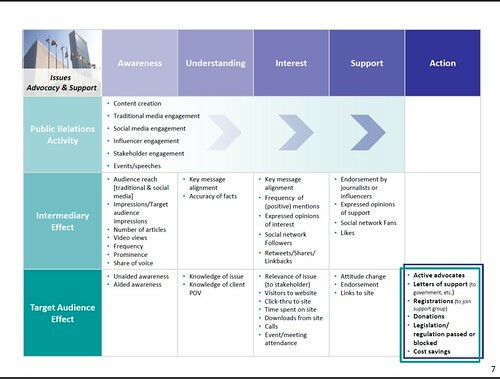 The “Valid Metrics Framework” were developed by AMEC to serve as a framework to identify possible metrics for measuring a communications program. These are simply a guidelines to help think through what to measure – or what metrics that will help your organization demonstrate progress towards an objective. The story is consumed by the target audience that leads to action and desired outcome: Metrics showing that the target audience has received the message and been inspired to take action. The other part of the matrix includes a continnum based on the “Marketing Funnel” or for nonprofits the “Ladder of Engagement” going from awareness, understanding, consideration, support and action. The document includes examples from different industries, including nonprofit organizations and for advocacy campaigns. 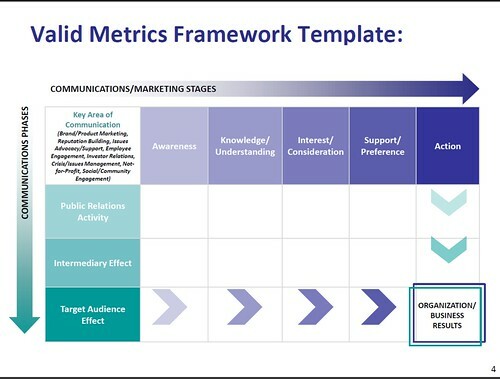 How would your nonprofit use this matrix to help measure and guide strategy formation? How would you adapt the matrix or resulting measurement strategy to fit your organization’s capacity? I often prefer the decision journey over the funnel for nonprofits. Essentially, this would expand on the Support and Action stages in your matrix, and would emphasize the viral nature of social media, where the target audience can grow into intermediaries and begin the journey anew. Lauren: I love that decision journey … gonna check it out. This is really great for nonprofits to track what’s effective social media and what’s not cutting it. Now there’s a better way to get in touch with your audience and make the most of it. Good post! There are some good ideas here, but whenever I encounter the words ‘actionable’ or ‘decision journey’ I begin to suspect I am listening to the wrong people caught up in their own parallel world.